As incoming Visual Arts editor I thought I’d take the opportunity to have a look at what’s currently on in museums and galleries across the UK related to art by, and the history of, women. 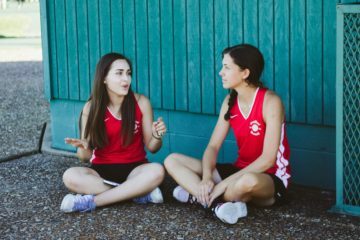 To my surprise there’s quite a lot – I’m so pleased by how much I found, and I hope this post brings something new to your attention so you can make the most of these amazing opportunities. I’ve specified when these are ending in March or April so you know whether they’re about to disappear. 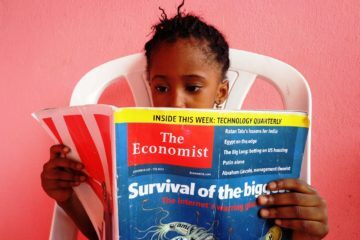 I’ll also post on Twitter about upcoming exhibitions and events. I’ve organised events and exhibitions by country, running roughly north to south. If I’ve missed out anything you think should be included, drop me a comment! As this is across a broad geographical area I haven’t had the chance to see many of these exhibitions; if you’ve visited one and have a response to or review of it, let me know. V&A Dundee is currently featuring Turner-nominee Ciara Phillips’ exploration of the interactions between the art of different women, while graphic designer Maeve Redmond looks at Scottish design. LifeSpace Science Art Research Gallery is hosting ‘Disentangle: Science in a Gendered World’ until 6 April, considering the interaction between science, gender and perceptions of gender. The exhibition ‘Changing Dundee’ is at Verdant Works until 31 March, featuring the work of printmakers Maya Abeysuriya and Marianne Wilson. In Glasgow, an exhibition of the work of the filmmaker, painter and poet Margaret Tait is running at the Gallery of Modern Art. There’s a tour looking at the role of Glaswegian women in suffrage campaigns at Kelvin Hall on the 27 March, and the exhibition ‘Decoding Inequality’ at the Glasgow Women’s Library is on until 6 April, where you can also see the art of Ruth Barker and Hannah Leighton-Boyce as inspired by their residency periods. ‘In-sight 16’, an exhibition featuring a number of works by female artists, is at Mostyn Gallery, Llandudno until 28 April. The Storiel Gallery in Bangor is hosting two exhibitions until 6 April; the painter Brenda Chamberlain, and the abstract work of Lisa Eurgain Taylor. The Ulster Museum in Belfast currently has two interesting exhibitions; ‘Making Her Mark’ is an exhibition of female print artists from the Museum’s collection, and ‘Fashion and Feminism’ explores “the links between styles and sisterhood” and how dressing to protest has more of a history than you might expect. You can see the work of the textile artist Hannah Grainger at Portaferry Castle. There’s also a talk in Hillsborough at Hillsborough Castle on the lives of women who have lived and worked there on 30 March. ‘Her Voice’ at the Bailiffgate Museum and Gallery in Alnwick celebrates “the cultural and creative role of women in Northumberland” until 31 March. In and around Newcastle, the work of the early twentieth-century painter Dame Ethel Walker is at South Shields Museum and Art Gallery until 27 April, and the Hatton Gallery is hosting a series of exhibitions contrasting the works of two artists, with the current installation comparing Francis Bacon and Ellen Gallagher. The Baltic Gallery in Gateshead is featuring the work of two female contemporary artists, Barby Asante and Heather Phillipson (latter until 24 March). Asante’s work aims to create areas of thought and discussion for considering performative actions, race, gender and the history of colonialism, and Phillipson’s is “somewhere between agricultural vista and lunar wasteland”. York’s Castle Museum is exhibiting a collection of Vivienne Westwood shoes until 28 April. You can also attend a spotlight talk on 21 March, as well as a curator’s talk on 29 March. There’s also an event looking at the history of corsetry on 25 March. York Art Gallery is hosting an exhibition of the ceramicist Lucie Rie. There’s loads happening in Leeds. At Abbey House Museum the exhibition ‘HeSheThey’ looks at the change of gendering in children’s clothing through history, and ‘Queens of Industry’ at Leeds Industrial Museum celebrates the stories of women in Leeds’ industry. You can also find material from the Feminist Archive North at Leeds City Museum. The Craft Centre and Design Gallery Leeds is hosting Anna Whitehouse’s extraordinary attempt to make 100 bottles in 100 days until 20 April, along with the prints of Gail Kelly. The Hepforth at Wakefield is holding a major exhibition of the ceramicist Magdalene Odundo. There’s an opportunity to look at the “hidden histories of magic and witchcraft” through texts on 28 March. The Brontë Parsonage Museum is also offering “the ultimate Brontë experience”, a chance to view some of the treasures of its collection not on display, on 29 March; at a wince-inducing £85 a head, though, this is probably only for the real Brontë enthusiast. Bury Art Museum has an exhibition celebrating the life and work of Victoria Wood, with curator’s talks on 29 March and 10 April. They’re also exhibiting the work of contemporary artist Jennie Franklin until 28 April. In Manchester, the ceramicist Halima Cassell explores nationality and heritage in her exhibition at the Manchester Art Gallery. There’s also a focus tour there of women in art on 6 April. Lucy Burscough’s striking portraits of patients with facial cancers is on exhibition at The Whitworth, with a panel discussion on 18 April. The work of Emma Lloyd is on exhibition at The Salford Museum and Art Gallery until 28 April, exploring “the shift between looking and reading” through sculpture and prints. The Pankhurst Centre is hosting the photograph portraits of Manchester City Council’s ‘Strong Manchester Women’ 2019. You can also learn more about Sylvia Pankhurst herself in an exhibition at the Working Class Movement Library from 29 March, with a talk by her biographer on 30 March. In Liverpool, the exhibition ‘Journey to Justice’, illustrating the struggle for justice in the UK and US, is at the International Slavery Museum until 7 April. The Museum of Liverpool also currently has a display about the struggle for suffrage in Liverpool. The exhibition of the modelling career of June Duncan continues at Sudley House, with a talk by the Senior Curator on 3 April. An installation by Turner Prize-winning artist Elizabeth Price continues in Nottingham, with a talk by the artist on 11 April. There’s also a talk on 27 March on women’s writing after suffrage at Bromley House Library, and a discussion of Georgian fashion at the Portland Collection on 26 April. In Birmingham, the exhibition ‘Women Power Protest’, celebrating the work of a number of female artists, continues until 31 March, with a virtual tour on 20 March. You can also see Rachel Maclean’s exhibition ‘Too Cute!’, which considers how objects can be both sweet and sinister. The gallery is also hosting a life modelling performance, ‘Truth is Beauty’, by Claire Collison on 23 March. The painter Tess Jaray is giving a talk on 23 March to accompany her ongoing exhibition at the Barber Institute. The Pitt Rivers Museum, Oxford, has an exhibition celebrating the work of Tibetan photographer Nyema Droma. There’s also a talk on the poet Elizabeth Siddal at the Ashmolean on 27 March. In Norwich, the pioneering photographer Olive Edis is on display at Ancient House. As well as a tour on 6 April, the exhibition Visible Women is running at Norwich Castle for two weeks from 14 April, bringing together art made and curated by women in their collection. In Cambridge, Julie Mehretu and Louise Bourgeois are both on exhibition at Kettle’s Yard until 24 March; ‘Projects’, a collaborative installation by Anthea Hamilton and other artists, also finishes on 24 March. As London has the highest concentration of things happening, I’ve separated ongoing exhibitions from one-off events. The first large-scale exhibition of the surrealist Dorothea Tanning in 25 years is at the Tate Modern. Three different photographers are currently on display. At the Tate Britain there’s an installation by Joanna Piotrowska, while the Hayward Gallery’s exhibition of Diane Arbus continues, with a talk on 23 March and a panel discussion on 1 April. ‘English as a Second Language’, a co-exhibition of Hanna Moon and Joyce Ng, is on at Somerset House until 28 April, with a round-table titled ‘Ban the B-Word’ on 29 March and a number of tours by industry professionals. In contemporary art, the work of the “neo-conceptualist” Jenny Holzer is at the Tate Modern. The exhibition of sculptor Phyllida Barlow continues at the RA, with a panel discussion on 20 March and a conversation with the artist on 10 April. An installation by Jarman Award winner Daria Martin is at the Barbican Centre until 7 April. Emma Kunz’s work is on display at the Serpentine, with a talk on 30 March. The first major solo exhibition of Morag Kiel continues at the Institute for Contemporary Arts until 14 April, with a BSL tour on 2 April. In performance art, the third Tate Live Exhibition is dedicated to Anne Imhof, running from 22 to 31 March. Richard Saltoun has launched ‘100% Women’, a 12-month programme exclusively featuring female artists; this begins with Rose English until 13 April, who is giving a talk on 11 April. three contemporary artists discuss the creation of the iconic Armada portrait of Elizabeth I on 12 April. Princess Pauline de Metternich on 10 April. I was really pleased to find that the Museum of Transology has a display at Brighton Museum, where you can also find ‘Queer Looks’, a display of outfits and oral histories from the LGBTQ community. O N C A is featuring an exhibition of enamel plate portraits by Ivy Rihlampfu from 10 April. In Bath, the exhibition of the clothes of royal women at the Fashion Museum and The Edge’s exhibition of the art of Emma Hart finish at the end of April. The work of award-winning photographer Matilda Temperley is on display at the Somerset Rural Life Museum. The Museum of Bath at Work has also extended its exhibition on the contribution of Bath women to the First World War until the end of March. Plymouth is featuring a series of female artists under the title ‘fig-futures’, with each exhibition running for a week in March. The exhibition ‘Raising Horizons’ is running until the end of March at the Royal Cornwall Museum, Truro, highlighting the important contributions of women in archaeology, palaeontology and geology. Finally, there are two exhibitions of female artists running at the Tate St Ives; the dramatic installations of Anna Boghiguian, with a curator’s talk on 28 March, and Amie Siegel’s multi-element film. To finish, I want to say explicitly that I am fully committed to The F-Word’s position on inclusivity and access as set out here. Nothing’s emerged from my brief research in compiling this post, but if any of the artists or institutions above hold problematic views in contrast to this please let me know. Feature image cropped from Flickr, used with permission. 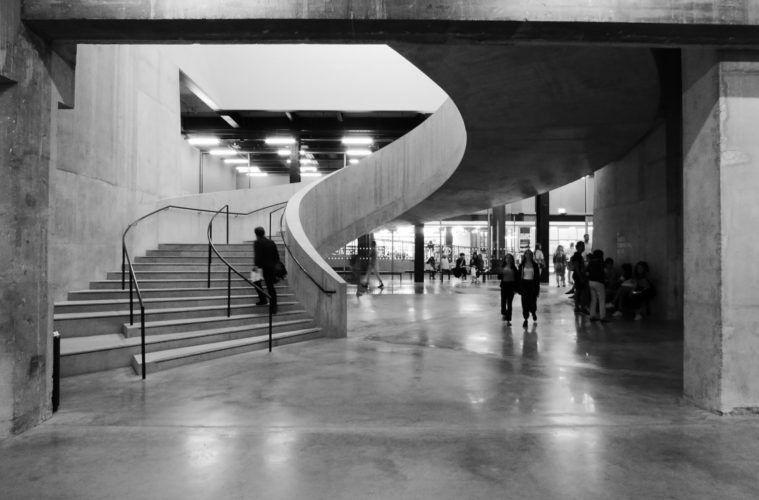 It’s a black and white photograph of a staircase winding to the right in a concrete hall (at the Tate Modern). First insert image adapted from Ulster Museum’s Facebook page. 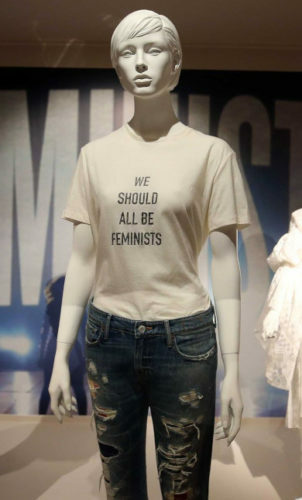 It shows a mannequin in torn jeans and a white t-shirt which reads “we should all be feminists”. Second insert image adapted from Birmingham Museum and Art Gallery’s Facebook page. 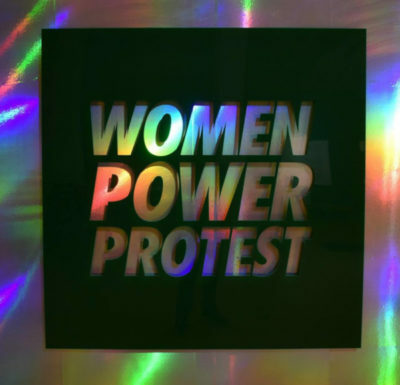 It shows a green stencil reading “Women Power Protest” on an iridescent background. Final inset image is taken from Somerset House’s Facebook page. 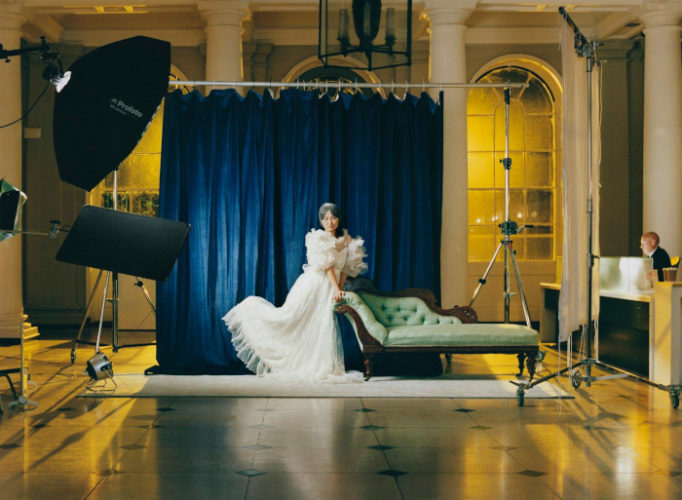 It shows a woman leaning on a couch in front of a blue curtain looking directly at the camera, surrounded by photography equipment.